Mars has distinct polar ice caps, but Mars also has belts of glaciers at its central latitudes in both the southern and northern hemispheres. A thick layer of dust covers the glaciers, so they appear as surface of the ground, but radar measurements show that underneath the dust there are glaciers composed of frozen water. New studies have now calculated the size of the glaciers and thus the amount of water in the glaciers. It is the equivalent of all of Mars being covered by more than one meter of ice. The results are published in the scientific journal, Geophysical Research Letter. Several satellites orbit Mars and on satellite images, researchers have been able to observe the shape of glaciers just below the surface. For a long time scientists did not know if the ice was made of frozen water (H2O) or of carbon dioxide (CO2) or whether it was mud. 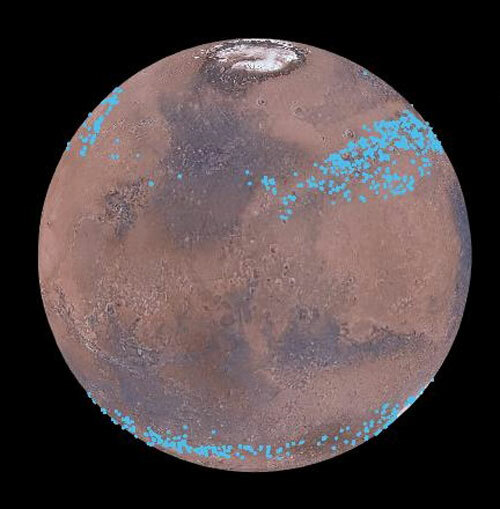 Using radar measurements from the NASA satellite, Mars Reconnaissance Orbiter, researchers have been able to determine that is water ice. But how thick was the ice and do they resemble glaciers on Earth? A group of researchers at the Niels Bohr Institute have now calculated this using radar observations combined with ice flow modelling. “We have looked at radar measurements spanning ten years back in time to see how thick the ice is and how it behaves. A glacier is after all a big chunk of ice and it flows and gets a form that tells us something about how soft it is. We then compared this with how glaciers on Earth behave and from that we have been able to make models for the ice flow,” explains Nanna Bjørnholt Karlsson, a postdoc at the Centre for Ice and Climate at the Niels Bohr Institute at the University of Copenhagen. Nanna Bjørnholt Karlsson explains that earlier studies have identified thousands of glacier-like formations on the planet. 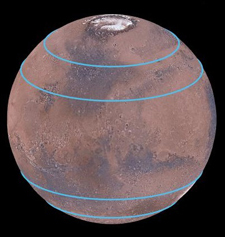 The glaciers are located in belts around Mars between the latitudes 300-500 – equivalent to just south of Denmark’s location on Earth. The glaiciers are found on both the northern and southern hemispheres. From some locations on Mars they have good detailed high-resolution data, while they only have more sparse data from other areas. But by supplementing the sparse data with information about the flow and form of the glaciers from the very well studied areas, they have been able to calculate how thick and voluminous the ice is across the glacier belts. 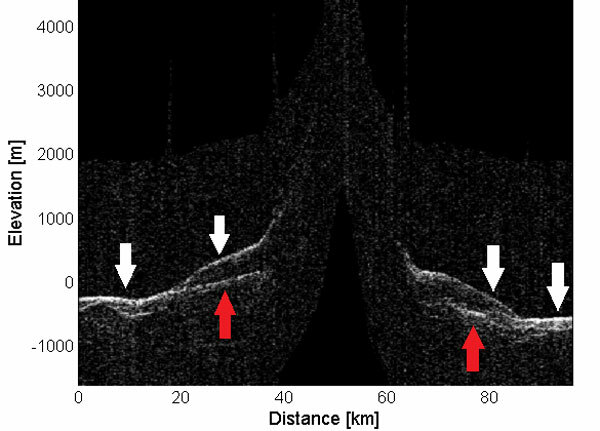 The image from the High Resolution Stereo Camera shows that a thick layer of dust covers the glaciers, so they appear as the surface of the ground, but radar measurements show that there are glaciers composed of frozen water underneath the dust. (Credit: ESA/DLR/FU Berlin). “We have calculated that the ice in the glaciers is equivalent to over 150 billion cubic meters of ice – that much ice could cover the entire surface of Mars with 1.1 meters of ice. 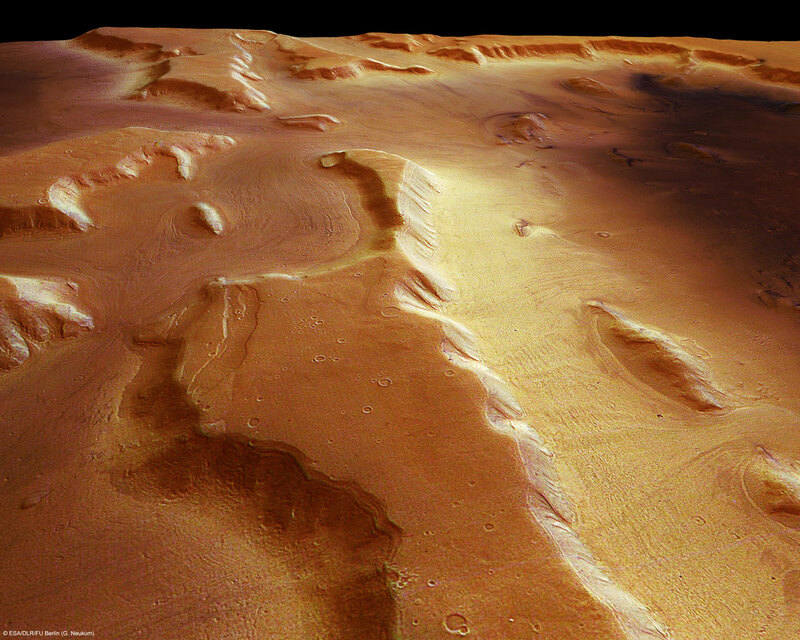 The ice at the mid-latitudes is therefore an important part of Mars’ water reservoir,” explains Nanna Bjørnholt Karlsson. That the ice has not evaporated out into space could actually mean that the thick layer of dust is protecting the ice. The atmospheric pressure on Mars is so low that water ice simply evaporates and becomes water vapour. But the glaciers are well protected under the thick layer of dust.